The power of a name and its value has long been immortalized in prose, poetry, and religious ceremony. Everyone recognizes the things around them by name. Naming a product is important. This post explains why the name of our software is DayTickler. A name is a word or combination of words by which an entity is designated and distinguished from other. You can hardly promote a product and expect it to bring huge benefits if its name bears no relevance to the target market. Contrary to Shakespeare’s belief that That which we call a rose by any other name would smell as sweet, the answer to the question “What’s in a name?” does not apply here. A name can make a large difference in the perception of what a product should be and how it should function. For those of you who follow this blog, you know that in recent months we have repositioned our startup Slingboards Lab and that we are currently designing a personal task planner for mobile phones. We are currently building a first version of the software. We plan to market it as a freemium application through the apps store of Apple, Android and Microsoft. The importance of choosing the right name for software is not to be taken lightly. Not only the name of your software is an important part of its “business card” on the web and in the apps store, but the name will enable customers to remember your product. This is about making your name talk-able. An easy name will make it easier for current users to refer your name to others. It is very well known that advertising is not a trustworthy marketing tactic as much as word-of-mouth. The name is probably the first thing prospective customers will find out about your application. It is a good way to differentiate yourself from your competition. We chose the name DayTickler. Not only it is talk-able and the domain name was available, but it clearly explains what differentiates our application of the hundred Todo apps that already exist on the market. First, it was important to have the word “Day” because our product is a daily planner. Second, we choose the word “Tickler” because it is a device that serves as a reminder and is arranged to bring matters to timely attention. But that is not all, a tickler is also a device that make someone laugh by lightly touching a very sensitive part of the body. Our product is different from competitors in that it allows to easily team up with your family and friends to achieve your todos. We can imagine that the action of chatting and collaborating online with your close ones looks a bit like the pleasure of being “virtually” tickle. Categories: DayTickler, Lean Startup | Tags: Brand, value proposition | Permalink. There are days when happiness is very few things. Today, I received by mail (in advance) the last album of Jean Leloup. This new album “À Paradise City” will officially be available Tuesday, February 3rd. Jean Leloup does not exist on the same plane as you or I. The Quebec rocker, troubadour, wanderer, lover of life, semi-reformed reveller, would-be philosopher and general mischief-maker has always floated above the crowd. That, along with a transportive catalogue of songs, has made him a hero in these parts – a free spirit, worn down but never quashed by life’s weight, temperamental and at times troubled but forever bouncing back to go another round. 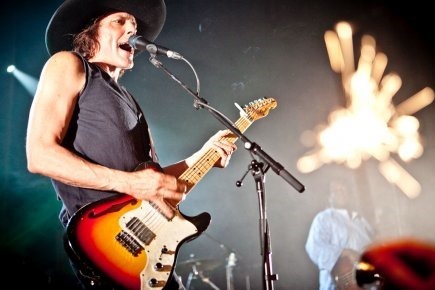 The least I can say is that I love Jean Leloup. What’s weird is that my 4 children also share this love. For them too, today, it was the party when they discovered the album. A united family. After several listens, my favorite songs are “Les bateaux”, “Voyageur” and “Zone zéro”. In fact, all the songs are good. If you like Jean Leloup run buy this album. The “wolf” is back and in top form. Categories: Lifestyle | Tags: personal | Permalink.